We often think of video games as fiction, but the U.S. government has weaponized them to advance its agenda around the globe. Nowhere is this more clear than in Venezuela, where the U.S. military has laundered regime change propaganda through some of the world’s most popular first-person shooter games. This March, amid a U.S.-backed right-wing coup attempt overseen by the Donald Trump administration, Venezuela experienced a sudden collapse of its electrical infrastructure, plunging the country into darkness. This has renewed focus on the role of video games in psychologically conditioning users to support the country’s destruction–and in foreshadowing specific events during the coup. Venezuelan citizen journalists Orlenys Ortiz and Sancocho Power have drawn attention to the similarity between the plot of a 2013 first person shooter game, Call of Duty: Ghosts, and alleged acts of U.S. sabotage against the country this March. Call of Duty: Ghosts is set in a dystopian future after the Middle East is nuked. A Venezuelan general comes into power, establishing a socialist style federation that spreads across Latin America like a disease, uniting all oil producing nations and expelling U.S. citizens. You as the player are part of an elite force of U.S. commandos that invades the country, murders the socialist leader, and destroys his federation. The U.S. Special Operations forces open their assault by launching a rocket at a dam that looks strikingly similar to Venezuela’s Guri dam, an act of deliberate terror that floods the streets of Caracas. The mission ends with the execution-style killing of Venezuela’s leader, who is shot in the back in slow motion by America’s finest. In case you weren’t sure about his commitment to socialism, he’s wearing a red beret–just like Hugo Chavez. Gamers get to play the part of Mattias Nilson, a Swedish sociopath who’s willing to kill anyone if the price is right. Under contract from a multi-national oil company, Nilson tears Venezuela apart and ultimately winds up blowing Solano’s brains out inside his palace–which looks suspiciously like the 4F compound where Hugo Chavez worked when he was president. 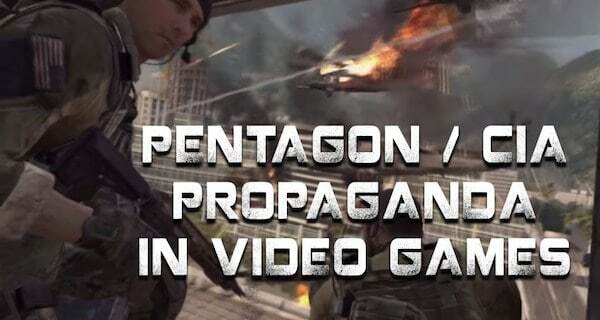 A decade later, Call of Duty designer Dave Anthony was enlisted by a former Pentagon official named Stephen Grundman to advise The Art of Future War Project–an initiative of NATO’s unofficial think tank in Washington, the Atlantic Council.